Developing countries require systems for measurement, reporting and verification of livestock greenhouse gas emissions that can capture emissions reductions linked to productivity. Agriculture directly contributes 10-12% of global greenhouse gas (GHG) emissions, 60% of which come from livestock (enteric fermentation and manure). Emissions from agriculture are likely to increase as developing countries seek to ensure food security for their growing populations and as trends toward increased meat consumption con tinue. 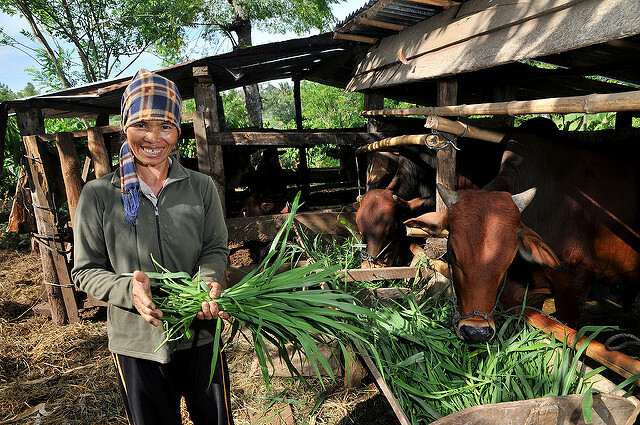 Ninety-two countries include livestock in their Nationally Determined Contributions (NDCs) to climate change mitigation. However, many countries cannot document livestock emission reductions through productivity gains and more efficient farm management because of simple reporting systems and insufficient data. As countries begin to implement their NDCs, there is strong interest and need to improve methods for measuring, reporting and verifying (MRV) emission reductions in the livestock sector. In response to countries’ interest and with input from technical experts from dozens of countries, UNIQUE Forestry and Land Use, the CGIAR Research Program on Climate Change, Agriculture and Food Security (CCAFS) and the Livestock Research Group of the Global Research Alliance on Agricultural Greenhouse Gases (GRA) authored the report, ‘Measurement, reporting and verification of livestock GHG emissions by developing countries in the UNFCCC: Current practices and opportunities for improvement’, to be released at COP23. “Our research found that of 140 countries interviewed, only five have MRV methods in place that can capture reductions in livestock emissions related to increases in productivity or improvements in agricultural management practices”, lead author Andreas Wilkes, UNIQUE Forestry and Land Use, said. The paper describes basic requirements for MRV as established in the UNFCCC and the IPCC and then assesses current MRV practices for livestock emissions in 140 developing countries. “Countries are innovating in exciting ways that reflect their own policy priorities. Sharing these innovations will help other countries identify pathways for improving their own systems”, said Lini Wollenberg, leader of the CCAFS Low Emissions Development research program based at the University of Vermont’s Gund Institute for Environment. “Key challenges are a lack of data and expertise and uncertainty about how to fill data gaps and best build capacity in key institutions”. The GRA and CCAFS are now working together with partner countries and other organisations such as the FAO, the UN Environment Programme’s Climate and Clean Air Coalition, and the World Bank to implement the report’s findings. Download the report: Wilkes, A, Reisinger A, Wollenberg E, van Dijk S. 2017. Measurement, reporting and verification of livestock GHG emissions by developing countries in the UNFCCC: Current practices and opportunities for improvement. Please note that the full report will also be published in French and Spanish later this year.